I love Sheet Pan Meals as most of you know by now. 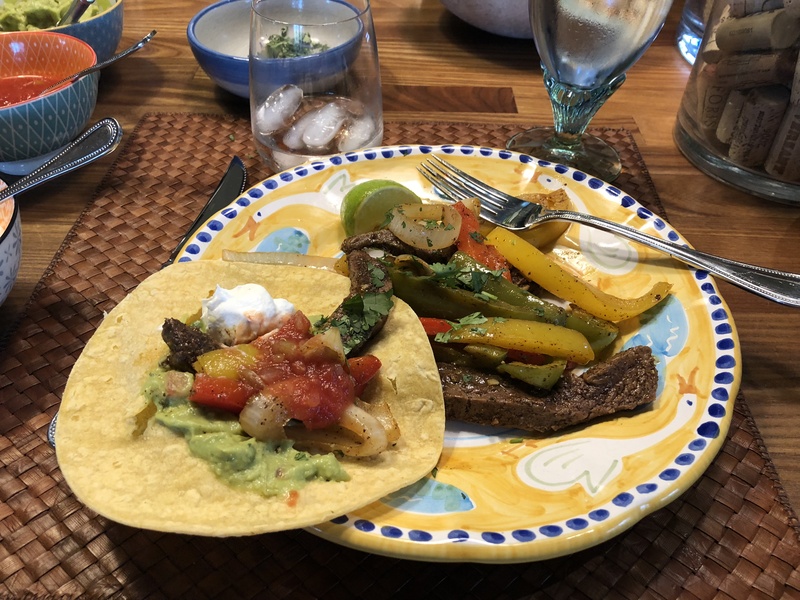 I also love Fajitas! They can be super healthy and light and when you make at home you’re in control of the oil and the salt and everything else that goes into them. I have to say I love them best rolled in a soft tortilla with guacamole and sour cream and a little hot salsa. They’re also good just served up on the plate . Rice and Beans are a nice side dish with this as well. This is a healthy and fun dinner for the entire family which you can make in under an hour. Everything cooked on the sheetpan which makes for minimal clean-up is a win win in my book. I had guacamole, chopped fresh jalapenos, sour cream , and some delicious salsa as toppings. This is entirely up to you. *side dish suggestions to stretch this meal would be rice and beans! 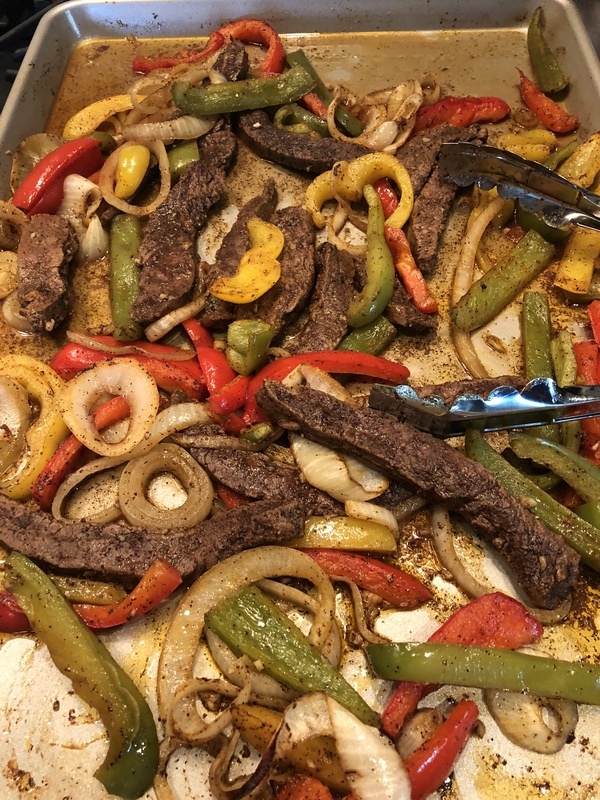 In a large bowl, combine steak strips , onions and bell peppers. Drizzle with 1/4 cup olive oil, sprinkle the minced garlic. Mix everything until it is evenly coated in oil and garlic. Sprinkle seasoning over everything. Mix again until everything is evenly coated. I sprayed a large sheet pan with cooking spray. I used a very large sheet pan if you don’t have a very large one you can use two sheet pans. Lay all the vegetables and meat onto the sprayed sheet pan (s). Try your best not to overlap and to spread in a single layer. Cook for about 20 minutes or until steak is finished. You may want to remove steak and continue cooking vegetables. I like my veggies a little crisp but don’t want to over cook steak. The last 5 minutes of cooking I placed tortillas in aluminum foil and placed right on the sheet pan to heat up. 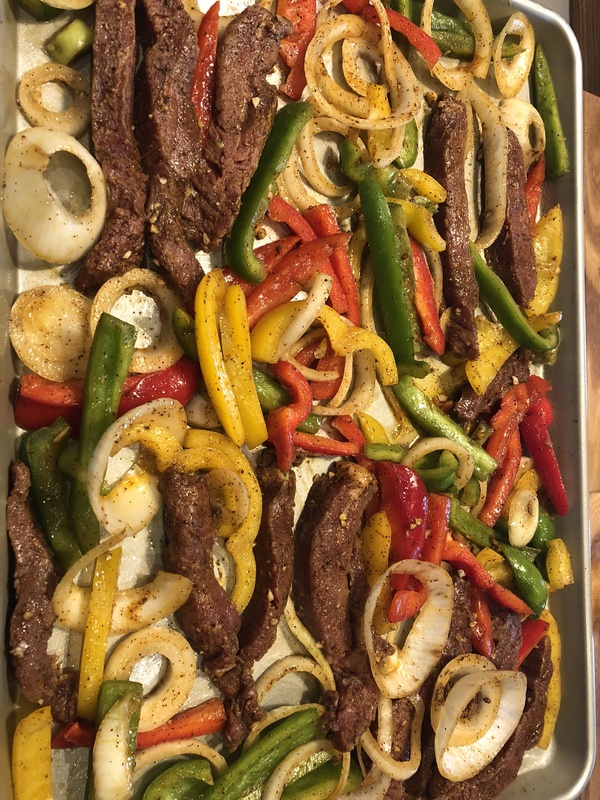 When veggies were finished to my liking I added the steak back on the sheet pan mixed everything up and plated it up. Served with warm tortillas and lime wedges and sprinkled cilantro ( optional) . 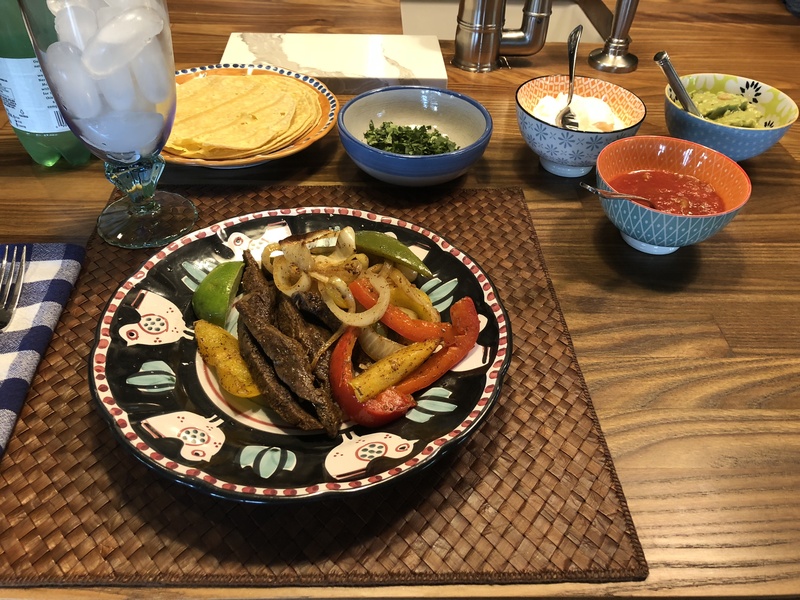 Put extra toppings on the table so everyone can make their own tortilla .